Double cleansing is an essential part of my skincare routine. In fact, it's one of the major reasons why I began to see a turnaround in my skin years ago. I only double cleanse in the evening since I'm removing makeup and dirt from the day. Typically I prefer an oil or balm-like cleanser as my first step because it cuts through my makeup, and works best for my combination skin. I learned many years ago (which made complete sense to me after someone explained it) that oil based cleansers bind better to oil thus properly cleansing the face without stripping it. Oil is essential for the skin's overall health so even though I have oily skin, using oil on my face will signal to my sebaceous glands that it doesn't need to produce anymore. I instantly began seeing fewer breakouts, less oil on my face and a healthier, more balanced complexion. Adding in the second cleansing step after removing my makeup became crucial because I was able to treat my skin with the benefits of that second cleanser. I regularly reach for a rich cream or soft gel because they help to nourish, comfort and hydrate my skin along with any additional benefits that may come from the cleansers' key ingredients. I am so excited to see brands finally selling actual double cleansing sets, and the two I have for today's post are beyond exceptional! 1. 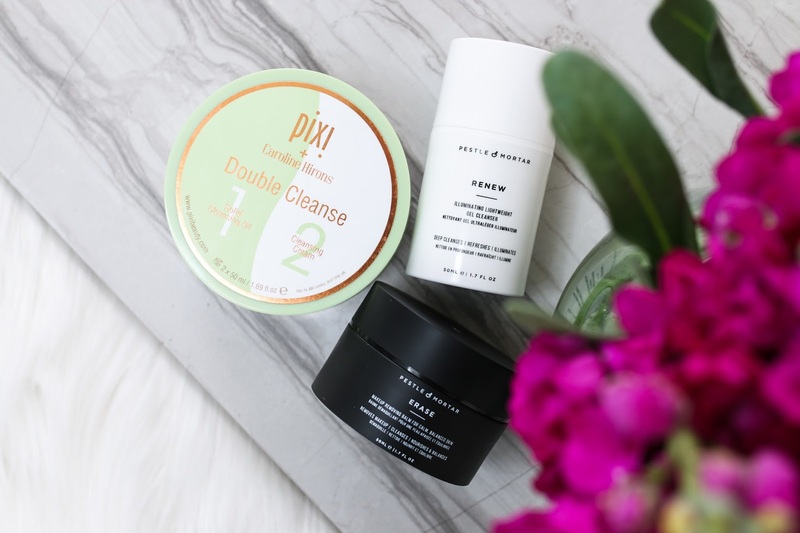 Pixi + Caroline Hirons Double Cleanse - Beauty blogger and industry legend, Caroline Hirons has been speaking about the benefits of double cleansing for years and it was only a matter of time before she created her own. 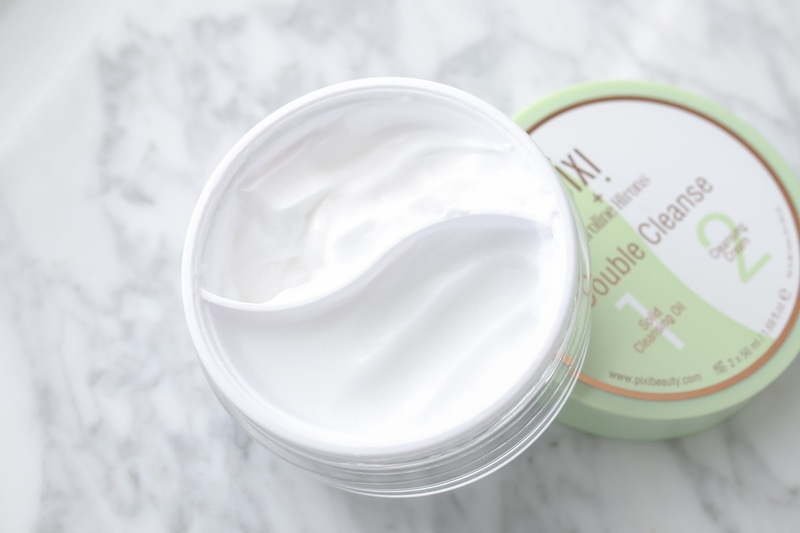 So in conjunction with Pixi beauty and Caroline, a solid cleansing oil and cleansing cream in one tub was born! And it is spectacular! I am already a HUGE fan of Pixi skincare (this is a staple for me), so I knew this would be a hit with my skin. The cleansing balm is solid though breaks down quite easily, removes every last stitch of makeup and emulsifies easily with water. It's a nice mix of oil and a solid so it will appeal to a wide variety of cleanser lovers. The cleansing cream side is like a big pillowy blanket for your face. The texture is fluffy, delicate and leaves my skin feeling softer than ever. My only request is that the tub be larger! I need more of each ASAP! 2. Pestle & Mortar Erase and Renew Cleansers - For those natural beauty lovers, this Pestle & Mortar double cleansing system is a definite must try. Whereas the Pixi cleansers left my skin very soft and comforted, this cleansing system gave me a fresh glow. 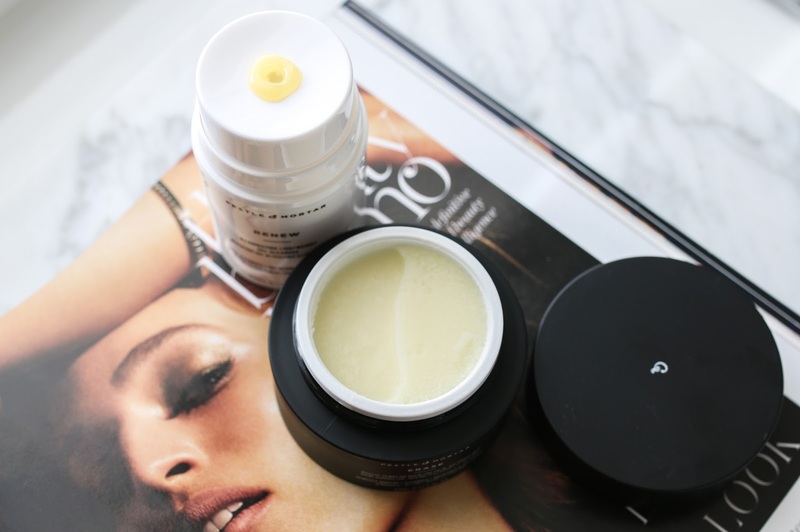 The cleansing balm is a tad more oily and runny than the Pixi (which I love equally as much) with a slight granular texture that gives a mild exfoliation. The kit comes with a cloth to remove the cleansers and I highly recommend using it. Both remove easily with just water, but using the cloth gave my face helped remove any rough texture on my face. The Illuminating Gel cleanser is described as a gel though to me it felt like a balm with more slip. Either way, it was glorious and really left my skin radiant and bright.